A rare drawing by John Lennon which sold Friday in a celebrity auction brings to mind a hair-raising story of when the ex-Beatle took a ride on the famous Palm Springs aerial tramway in California. The ballpoint pen drawing shows Lennon, girlfriend May Pang and Harry Nilsson sitting on a tramcar thousands of feet off the ground in midair. This rare drawing was auctioned off along with several other John Lennon sketches from the 1970s on Friday March 21 by CooperOwen Auctions in London. 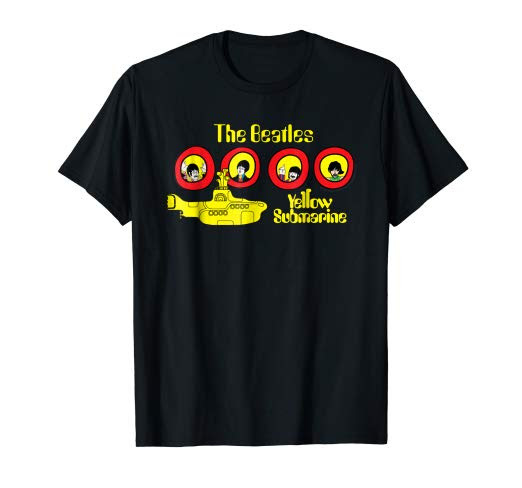 The drawings were given to guitarist Jesse Ed Davis from Lennon. Davis was a session musician who played lead guitar on Lennon’s albums “Walls and Bridges” and “Rock and Roll”. In March of 1974, John Lennon was in the midst of his “Lost Weekend” with girlfriend, May Pang, on the West Coast. He had temporarily split from wife, Yoko Ono, and was partying and carousing with friends like Harry Nilsson in Los Angeles. 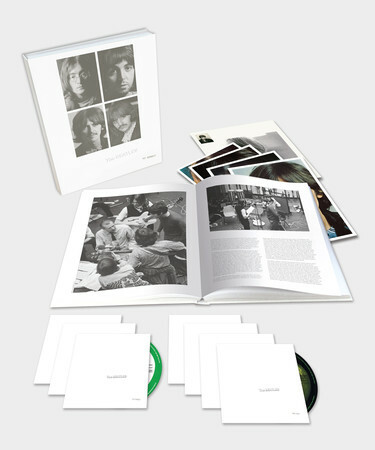 On a weekend getaway, Lennon, Pang, Nilsson and his girlfriend, along with former Beatles’ roadie, Mal Evans, drove to Palm Springs from L.A. May Pang recounts the trip in her book “Instamatic Karma” showcasing pictures she took of John and Harry sitting outside on the grass in Palm Springs. 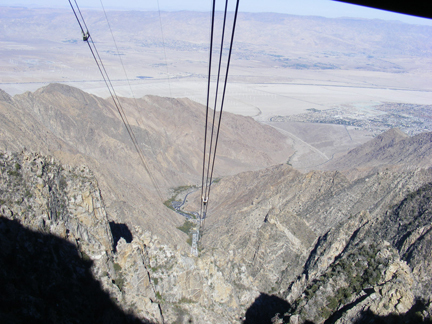 It was Harry’s idea to go to Palm Springs, the desert retreat once known as the “Playground of the Stars,” and he suggested that they all go to a restaurant and bar which just happened to be at the top of the tramway. The amazing 10-minute tram ride has to be seen to be believed. 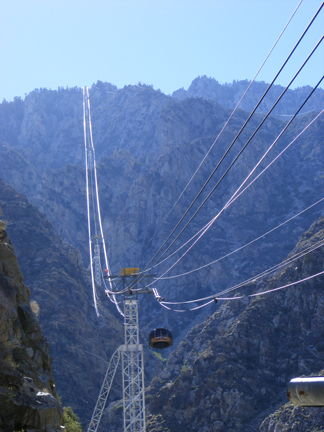 The tram, located at the northern end of Palm Springs, follows an extremely steep route traveling 2.5 miles up the side of the San Jacinto mountains. 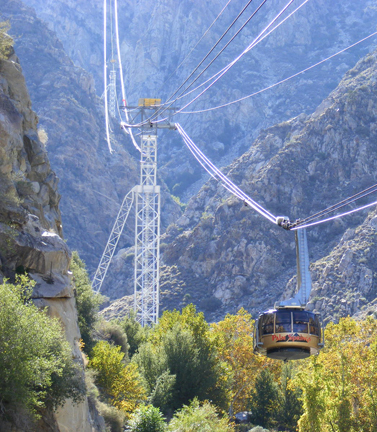 The tram ride begins at the bottom of the cliffs of Chino Canyon at elevation 2,643 feet and ends at elevation 8,516 feet. Having the tram stop in midair dangling over the mountainous cliffs would be a harrowing experience for anyone, and that’s exactly what happened when John Lennon was on the tram. May’s story ends there, but obviously, the tram soon regained power and delivered the passengers safely to the floor of the Coachella Valley. Since 1963, nearly 18 million people have taken a ride on the Palm Springs tramway, but only a countless few have actually been stuck on the tram, and now we know the fascinating coincidence that John Lennon was one of them. Categories: Beatles History, Beatles Travel: USA | Tags: aerial tramway, auction, beatles auction, Harry Nilsson, john lennon, may pang, palm springs, palm springs tram | Permalink. That was hysterical. Reminded me of a similar one I took in the mountains just outside Hiroshima a couple of decades ago. As always, John’s drawings are great to see.